Individual parish council websites (where available) can be reached by clicking on the names aboves. Should we all be independents? There is often support for the notion that all local councillors should be ‘independent’ and free from association with the major national parties. It’s a cute idea, but it’s flawed. 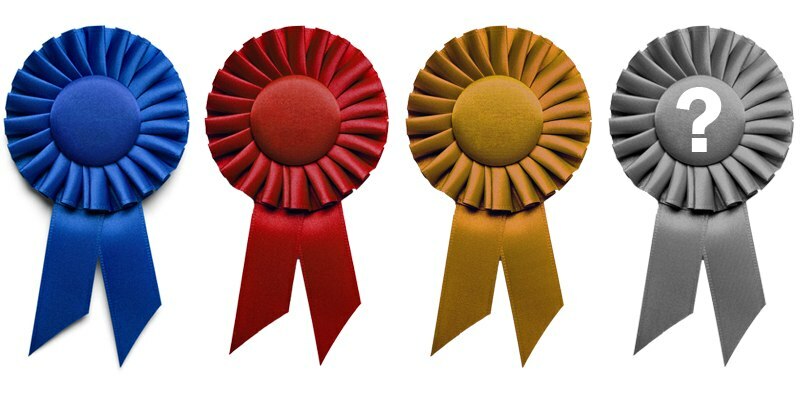 There are some great independent councillors but also some very poor ones, exactly the same as those with blue, red or orange rosettes contain a mix of passionate, engaged and effective representatives sat on the same benches as the clueless and the careless. Aligning yourself to a particular party does not automatically make you better or worse. For me, the party affiliations are broad statements about where you stand on personal freedoms and choice versus state control for the (hoped for) greater good, and about from who and by what mechanisms you collect the taxes needed to pay for public spending. That’s a one sentence summary of infinitely complex economic arguments, but it’s a start point for the “party vs independent” discussion. In my time as an elected Councillor, I have had the opportunity to mix with colleagues from other authorities (not just unitary authorities like mine, but also districts and counties) from all over the country and across the spectrum of political control. What is abundantly clear from those discussions and friendships formed is that there is a real variety of behaviours and working practises across different councils. If the notion of “orders from on high” were true, that diversity simply wouldn’t exist. Declaring a party allegiance is, as referred to above, a very broad statement – a start point for explaining what you stand for but by no means the detailed description. For some people, that broad start point is all they want to know, they vote for you (or insist they never will) but don’t want to engage in more detailed discussion. For other people, they get to know a bit more about you through public events or because you knock on their door, and that determines their voting preferences. All of which is to say, if the local independent candidate impresses you then that’s great, they deserve your support. There are some great ones out there. However, voting ‘independent’ as a supposed point of principle is blinkered and no different to the automatic vote for any particular party that you think you are rebelling against. For as much as there are good independents, there are also bad ones – voter beware. It is no secret that there is a party whip in Parliament and, with up to 650 votes up for grabs on any issue, there is a reason for that. However, my experience at a local level has been that this sort of whipping just doesn’t exist. It may do elsewhere, but not in Central Bedfordshire. Have colleagues explained to me why they think a particular result on a vote is important? Of course, it would be perverse if they did not. Have they ever then followed that up with an instruction about how I cast my vote, or threats as to the consequences if I break rank? Absolutely not. See also Cllr’s Dodwell’s thoughts here – no one gives Amanda instructions, nor does she seek to dish out the orders to anyone else. I’m with Amanda in principle (but we each make our own decisions on specifics!). Vote or don’t vote, it’s your choice (but seriously, why abstain unless you really don’t care what happens around you, and why have you read this far through a political blog post?). If you live in my ward, then I hope you can be persuaded to vote for me. 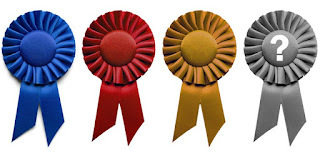 Whatever your position, please remember that the badges we wear are just the start point, not the full story and, if you really think that a protest at local elections “sends a message to Westminster” then you are over-estimating how much significance Mrs May, Mr Corbyn or their advisors will attach to results before the spinning starts. Your local election vote will determine your local council, and implicitly what happens in your home village or town, for the next four years irrespective of Brexit or Parliament; use your vote wisely. I am concious that it is almost two years since I posted here. The dominance of Facebook pushed this sort of site to the side, but the ubiquitous FB is perhaps not the best forum for all communications. You might get more 'hits' but so many of them are people passing by at speed. Apologies for the absence but, for today at least, I am using this site once more. All sessions run 2PM to 8PM, no appointment necessary. The 18 July event at CBC's main offices is for members of town or parish councils only, but the other five are open to all. If the date for the venue nearest you is not convenient, you can still attend one of the other events; they are not area specific. 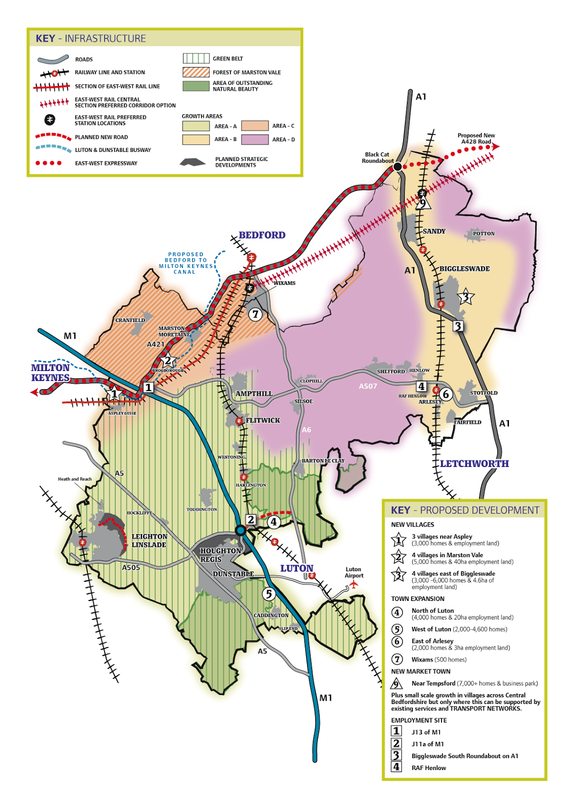 Central Bedfordshire have been working on a new local plan for some time now. There is plenty more detail available here. Whilst there have already been various elements of public engagement as part of the evidence gathering process, they have only now reached the stage of the first statutory public consultation (known in planning terms as Regulation 18). The consultation period will be open from 04 July 2017 and close on 29 August 2017 (a period of eight weeks); during that time there will also be opportunities for people to ask further questions and seek clarifications. 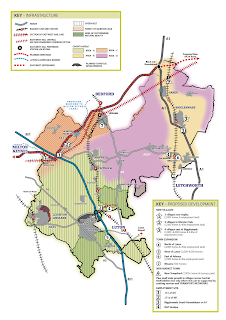 Residents of Caddington, Slip End and nearby hamlets will no doubt take a keen interest in the draft plan given that the dreaded phrase "west of Luton" is rearing its ugly head again. I suspect that opinion will be split on whether this is a good or bad thing; that split is not likely to be an even 50/50. It needs to be understood that the pressure to provide new housing (and associated jobs and infrastructure) in this part of the country is overwhelming. Politicians from different sides may argue over the best way to provide this housing but none of the major parties take a position which reduces the numbers. Central Bedfordshire can not avoid significant amounts of housing being provided in the short and medium term (this plan looks through until 2035) and, if that is accepted as fact, then it follows that having some sort of structured approach through a Local Plan is the approach needed to try and plan for and address the infrastructure issues that are intrinsically linked to sustainable development. 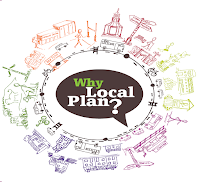 Failure to deliver an up to date Local Plan leaves the authority more exposed to hostile applications from developers and also at risk of Central Government intervention to take control in the absence of a plan. The nature of Regulation 18 is consultation on a DRAFT plan; feedback received plus ongoing work on whether sites are deliverable and sustainable will then further refine the detail before Regulation 19 consultation in about a year's time. This consultation is about OPTIONS for growth; the areas up for discussion are not yet filtered down to preferred options and some may well be dropped as the process continues. Similarly, the map and accompanying narrative deals with broad locations and not specific sites. By consulting on more than might eventually be needed, there remains flexibility within the consultation process to further filter out unsuitable sites. 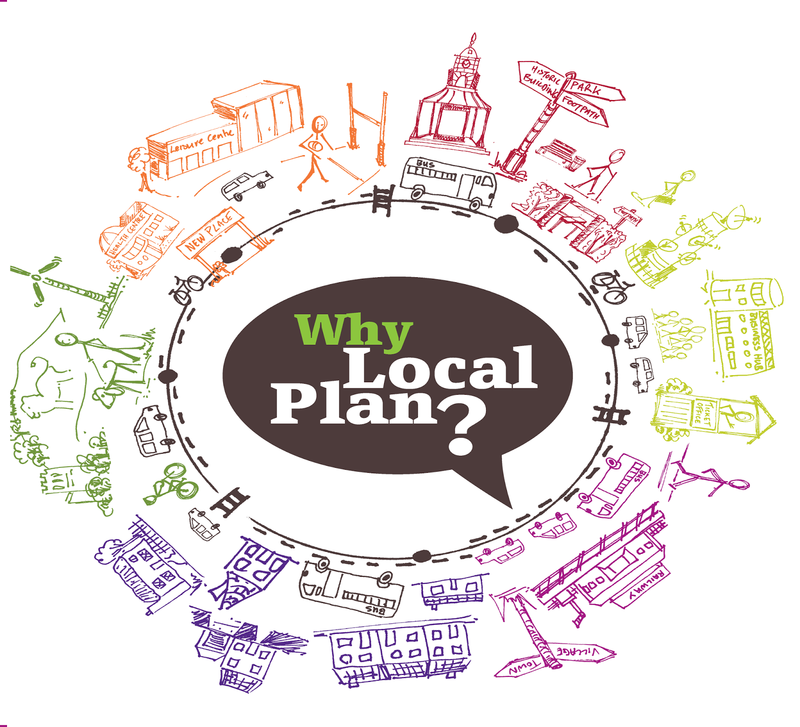 People can (and indeed should) play an active part in commenting on the draft plan and helping shape the further refinement of the plan over the next year; people will have right and proper concerns about their particular part of Central Bedfordshire but everyone should be absolutely clear that failing to deliver a local plan would be the worst possible outcome for all of us. Please do follow the links, study the evidence base and comment as you see fit. I heard a frankly bizarre interview on BBC 3 Counties Radio this afternoon and then, somewhat to my surprise, encountered the interviewee earlier this evening. 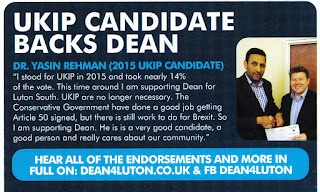 Mr Ujjawal Bhardwaj (also known as UB) is standing as the UKIP candidate in Luton South for the 2017 general election; unfortunately, he is somewhat frustrated that his 2015 predecessor Dr Yasin Rehman has chosen not to stand again for UKIP but rather to endorse Conservative candidate Dean Russell. 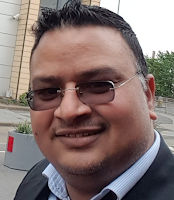 UB has taken exception to a Conservative election leaflet which references the endorsement from Dr Yasin Rehman as he fears that people will mistakenly think it refers to him. Given that the leaflet clearly shows the name of the previous candidate and the 2015 date, this seems unlikely. UB's claim that people might mistakenly think from the picture that he and Dr Rehman are the same person also seems unlikely; I really don't think they are lookalikes. All of which led to the bizarre situation of encountering a panicked and agitated UB outside my local Co-Op proffering his own leaflet and asking if I had seen the Conservative one (I did later point out to him that I was included in the group photo on the very page he was waving in my face). I also enjoyed his confident claim that he was expecting to receive 10,000 votes on Thursday. His enthusiasm is clear but perhaps a little misguided; given that the entire campaign team seems to have dwindled to one man, it is a bold claim to think he might almost double the vote. We did also discuss the paradox that by defaming the Conservative candidate (and he should be thankful that some of the claims he made were not recorded), he risked diverting votes from a Brexit supporting candidate and sending them back to someone who voted remain and subsequently abstained on Article 50 - a strange position for a UKIP candidate, even if that candidate is ex Labour. Not long now until the campaign is over, we go to the polls and then find out the result. I doubt UB will get his 10,000 votes but I am sure he will learn from his campaign experience. This is a personal blog; nothing posted on here should be taken as representative of the views of any other person or organization. You can contact me using the details below if you have any concerns about my postings. This site allows anyone to post comments; your views are welcome and encouraged! Comments are not moderated but may be removed if they are defamatory or offensive. Anonymous postings can be made but, if you want your point to be taken seriously, please put your name to it.